1. 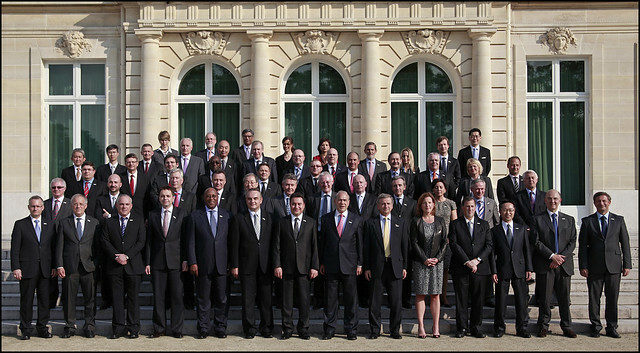 Ministers from OECD countries met under the Chairmanship of the Republic of Turkey and the Vice-Chairmanship of Chile and Poland in Paris on 23-24 May under the heading “All on Board: Policies for Inclusive Growth and Jobs” to define the policy strategies needed to support the recovery from the worst financial and economic crisis of our lifetimes, promote inclusive growth and deliver much needed jobs. The MCM 2012 benefited from the participation of the Russian Federation, and Brazil, People’s Republic of China, India, Indonesia and South Africa. They issued the 2012 Ministerial Council Statement, which provides Ministerial guidance on the current and proposed OECD programme of work. 2. Ministers underlined the importance of promoting inclusive growth and creating jobs through structural reforms, fighting youth unemployment, increasing long term investment and regional integration, as well as to repair, reform and strengthen the financial system to make it more resilient. They also called for the OECD to give strong attention to the development challenge, and underlined the importance of OECD work on inequality. 3. They also highlighted the need to communicate with citizens and cooperate with social partners, the need for coordinating policies and the exchange of best practices, as well as the usefulness of benchmarking performances. They called on the OECD to continue its leading role in doing so. 4. Ministers called upon the OECD to continue delivering first-class policy analysis and advice, in particular by integrating and deepening its advice to “go structural”, “go social”, “go green” and “go institutional”, as these four elements would provide the solid foundations required to restore confidence and to promote inclusive growth and jobs. In this context, Ministers expressed strong support for and agreed to launch the initiative New Approaches to Economic Challenges, which should analyse the root causes of the crisis, draw lessons from it and, as appropriate, adjust the OECD’s economic analysis and policy recommendations. They called for focusing on delivering practical policy recommendations to Members and underlined the importance of horizontality in doing so. Ministers invited the Russian Federation and the Key Partner countries to be involved in the work from the outset. The OECD work on Measuring Progress will contribute to this endeavour. They called for the process to be inclusive, remain focused and with an important role for OECD Committees, particularly the Economic Policy Committee. The exact modalities and scope of its implementation, including the establishment of a group chaired by the Secretary-General and reporting to Council, will be decided by the Council after the MCM and before the Summer break. They asked the Council to provide regular guidance on the initiative and for the Organisation to provide a progress report at the next MCM in 2013. 5. Ministers recognised that structural policies, green growth, and science, technology and innovation policies can be mutually reinforcing. They called upon the Organisation to implement the Innovation and Green Growth Strategies endorsed at the 2010 and 50th Anniversary 2011 MCMs, by mainstreaming their related policy recommendations into its regular policy analysis and dialogue, by monitoring progress through peer reviews and further development of Green Growth indicators and the compilation of relevant data. More broadly, they committed to supporting policies for greener growth and development and to contributing to the up-coming UN Conference on Sustainable Development (Rio + 20) and to future G20 discussions. In addition, Ministers endorsed the policy statement from the EPOC Ministerial Meeting and from DAC SLM to the Rio +20. They also noted the importance of the Green Growth Strategy at both urban and regional levels, as well as developing appropriate risk management. They also welcomed the interim report on “New Sources of Growth: Knowledge-Based Capital”, underlying that the emerging policy issues being raised in this work will be central to growth and innovation for the foreseeable future. They called upon the OECD to prepare an integrated policy report for the next meeting in 2013. 6. Ministers discussed the trend of rising inequality and recognised the related economic, social and political challenges. They welcomed the OECD analysis of trends and drivers of inequality, as well as of the policy options for its mitigation. Ministers agreed that ongoing fiscal consolidation and structural reforms should take account of the challenging social situation and the need to lift economic growth prospects. In particular, they called upon countries to tackle increasing inequalities through “making work pay” approaches, support for low-income households, financial inclusion, as well as investment in people and jobs. They welcomed the OECD’s path-finding work on strategies to tackle youth unemployment. They noted the OECD recommendations on labour and product market reforms as well as tax and benefits systems to promote a better distribution of income without unduly blunting incentives, and to consider how public services or in-kind services contribute to reducing inequalities. Financial education and financial consumer protection are also key in this context and can also contribute to the sustainability of the financial systems after the crisis. Ministers asked the OECD to continue and deepen its work in these areas and to provide policy options to address these challenges. 7. Ministers endorsed the OECD Skills Strategy, which provides for investing in people’s skills and education to improve their marketability in the current juncture. They recognised the value of the Strategy in helping countries to identify the strengths and weaknesses of their national skills systems, benchmark them internationally, and develop policies through a whole-of-government approach that can help to transform better skills into better jobs, contributing to economic growth and social inclusion. Ministers committed to reflecting on the policy advice provided in the Strategy and to taking concrete measures to foster the relevant skills and ensure a better match between available skills and those needed in the labour market. Ministers recognised the relevance of cross-border skills policies and the importance of flexibility and agility to respond to emerging needs and to be effective in different local contexts. Ministers noted that integrating various human resources, including under-represented groups, such as women, migrant workers and people with disabilities, into the labour force has a great potential to increase the skills base in an economy. 8. They agreed on a mandate for the OECD to assist countries with the design of national and local skills strategies, to put such strategies into practice and to extend this work to developing countries. Ministers welcomed the unique opportunity provided by the OECD Survey of Adult Skills to measure available capacities in the market, to improve the use of skills in the workplace and to assess how skills translate into economic and social outcomes. They encouraged the OECD to highlight the main insights of the Survey of Adult Skills in the OECD Skills Outlook and looked forward to subsequent editions, providing comparative and country-specific analysis featuring the OECD’s ongoing work on skills, and offering related policy advice. They also supported the establishment of an interactive, online portal for skills -- Skills@OECD -- which will allow governments, researchers and other stakeholders to access the OECD’s stock of data and analysis on skills in the most up-to-date form. The Ministers noted the Chair’s intention to host an informal meeting for Ministers of Education on 2-3 October 2013 on the theme of fostering skills. 9. Ministers discussed the persisting gender gaps in education, employment and entrepreneurship, and recognised that gender equality is a constant challenge and deserves higher priority in the governments’ agenda, not only for reasons of fairness and equity, but also to strengthen inclusive growth, reduce poverty, improve governance, encourage innovation and help mitigate the effects of ageing populations. They also highlighted that economic empowerment of women is a prerequisite for achieving the MDGs and a catalyst and multiplier of development efforts. 10. They welcomed the work carried out by the OECD Gender Initiative to highlight these gaps, share policy experiences and good practices in reducing them. Ministers agreed on the need to change attitudes towards the role of women in society and the economy and to develop appropriate working environment; encourage more female participation in science and technical fields; provide good-quality affordable childcare and ensure that work pays for both parents; promote better sharing of parental leave and work at home; introduce targets and measures to increase female representation in management, on company boards and in politics, and ensure equal access to finance for male and female entrepreneurs. Ministers called upon the Organisation to finalise this work, in particular by continuing to build up the database on female entrepreneurship. Based on the final report of the Initiative, they also mandated the relevant Committees, to update, broaden and, where appropriate, strengthen the OECD 1980 Declaration on Policies for the Employment of Women to develop a Recommendation on Gender Equality. They also asked for the Organisation to monitor and benchmark progress and report back regularly. 11. OECD work on competitive neutrality was welcomed. The OECD was asked to expand this work, in co-operation with the Russian Federation and Key Partners, and to engage in a dialogue on policies by home and recipient countries related to state-controlled enterprises’ international trade and investment, to promote a level global playing field, to fight protectionist practices and support growth and development. 12. Ministers also recognised the contribution of Small and Medium-Sized Enterprises (SMEs) to growth and innovation, job creation and social inclusion and called upon the Organisation to continue its work in this area, including on SME finance. 13. Ministers discussed the results of the OECD-led International Collaborative Initiative on Trade and Employment (ICITE) as a timely contribution to efforts to promote job creation and to spread the benefits of trade broadly. They welcomed progress made to date in the identification and cataloguing of regulatory barriers to trade in services. Ministers welcomed OECD efforts in measuring trade in value-added terms, and asked the Organisation to analyse the policy implications of rising global production networks on employment and growth among OECD Members, the Russian Federation and the Key Partner countries for the MCM in 2013. 14. Ministers reaffirmed their commitment to an open multilateral trade system, to further liberalisation, to fight against protectionism and to refrain from adopting measures, which restrict trade and are detrimental to investment. Some Ministers highlighted the importance of the conclusion of the WTO Doha Round. To this end, Ministers agreed on standstill and roll back commitments, as it was also reaffirmed in the G20 Cannes Summit of last year. They asked the OECD in continued collaboration with WTO and UNCTAD to monitor such measures, and for the OECD Trade Committee to carry out its decision to provide a report and a workshop assessing the impact of trade related measures, for their next meeting in 2013. They encouraged the OECD to accelerate and broaden its work on developing Services Trade Restrictiveness Indices and to extend this work beyond OECD Members to include, as a priority, the Russian Federation and the Key Partner countries, with results expected at the MCM in 2014. Ministers recognised trade facilitation as a major driver of competitiveness and an important tool to increase jobs and growth and invited the OECD to contribute its expertise, including on aid-for-trade. Ministers also encouraged the OECD to maintain its prominent role in promoting open markets and legal certainty for international investment and responsible conduct of multinational enterprises in close co-operation with the Russian Federation and Key Partners. 15. Ministers reaffirmed their commitment to global development and endorsed the OECD Strategy on Development as an essential tool to ensure that the Organisation’s work in this field is strengthened, mainstreamed and responsive to fast-changing global realities where countries at varying levels of development can contribute to global sustainable growth. Ministers welcomed that the Organisation would apply a more comprehensive and inclusive approach to development, strengthen its work on policy coherence for development, and further deepen its contribution to global processes and development architecture. Ministers called upon the OECD to strengthen its policy dialogue with developing countries through effective and mutually beneficial collaboration to help make reform happen. Recognising that there is no one-size-fits-all approach, Ministers welcomed innovative approaches such as multi-dimensional country reviews, as well as “cluster approaches” applied to countries facing similar structural features of policy challenges. They also called upon the OECD to reassess and adapt, where relevant, its frameworks and mechanisms for broader application in a more diverse set of country circumstances. Ministers emphasised the need to prioritise and sequence the follow-up activities for effective implementation of the Strategy. 16. Ministers welcomed the OECD’s efforts in forging the Global Partnership for Effective Development Co-operation, which was endorsed in Busan at the end of 2011 by a broad range of countries, including the Russian Federation, Brazil, People’s Republic of China, India, Indonesia, Russia and South Africa, and international organisations. They called for the continued contribution of the OECD Development Assistance Committee to support the effective functioning of the Partnership, which embraces diversity and recognises the distinct role that different actors can play in supporting the achievement of inclusive growth and sustainable development, and to strengthen the Organisation’s dialogue with various stakeholders, including emerging economies. 17. The Ministers welcomed current efforts by the Organisation to remain at the forefront of integrity and anti-corruption efforts, and called for it to strengthen its standard-setting role and peer review process in this area. They welcomed the Russian Federation and Colombia as new members of the Working Group on Bribery in International Business Transactions, and the recent OECD Recommendation on Public Governance of Public-Private Partnership. They also reaffirmed their commitment to implementing the OECD Anti-Bribery Convention and other anti-corruption related instruments. In this regard, they welcomed the adherence by Tunisia, Morocco, and Colombia to the Declaration on Propriety, Integrity and Transparency in the Conduct of International Business and Finance. They noted the CleanGovBiz initiative, building on the PIT Declaration, as well as the possibility to undertake “Integrity Scans” based on the OECD Toolkit for Integrity. They finally welcomed the role the OECD has played as coordinator of the G8 Deauville Partnership in its efforts to improve governance. 18. Ministers underlined the importance of Russian accession for the OECD and for Russia itself, and emphasised that this should be considered as a means to modernise the Russian economy and improve the well-being of its citizens. They welcomed the accession of the Russian Federation to the Nuclear Energy Agency and called for a fruitful co-operation that will support the Agency in its mission of maintaining and further developing, through international co-operation, the scientific, technological and legal bases required for a safe, environmentally friendly and economical use of nuclear energy for peaceful purposes. They also congratulated the Russian Federation on its accession to the WTO and encouraged the Russian authorities to take all the additional steps necessary to advance the OECD accession process towards a successful conclusion in accordance with the 2007 Roadmap. They welcomed Russia’s willingness to meet the standards required for accession to OECD membership. They called for engagement of the Russian authorities in all policy areas and underlined the importance of implementation and enforcement, as well as of strengthening the effectiveness of the rule of law. They insisted that OECD high standards and values must be maintained and warned against overly lengthy transition periods to meet with them. 19. Ministers welcomed the OECD’s efforts and progress in strengthening its relationship with Key Partners (Brazil, China, India, Indonesia and South Africa) as a critical avenue to implementing the 50th Vision Statement’s call for the OECD to become a global and inclusive policy network. They underlined that this co-operation with Key Partners is of strategic importance and of mutual benefit, and critical for the Organisation to remain relevant and inclusive. They underlined the importance of focusing on the actual needs of Key Partners and to listen to their views, while maintaining the Organisation’s standards and values. They called upon its Secretary-General to look at practical ways to facilitate and deepen the relationship, to work on specific strategic programmes of mutual interest through such means as framework agreements, their further participation in committees, enhancing communication, as well as the possible establishment of dedicated contact points in capitals. They noted formal expressions of interest from some countries for membership and asked, based on rules and procedures of the Organisation, for a general reflection in the Council on how to move forward, including a discussion on accession criteria. 20. The Ministers expressed their intention to deepen policy dialogue with other countries and regions based on mutual benefit and interest. They shared the view that becoming more inclusive also calls for strengthening regional initiatives in Latin America, Eurasia, Southeast Europe and Sub-Saharan Africa, in addition to Southeast Asia, which has already been identified as a strategic priority for the Organisation. They also looked forward to the early conclusion of work on new and simplified rules on participation by partner countries in OECD bodies. 21. Ministers welcomed the OECD’s support to MENA governments in their reform efforts, as well as to donors to refocus their assistance programmes to meet the region’s key policy priorities. They underlined the importance of economic reforms that need to go hand in hand with political ones, include a strong social dimension, and lead to an expansion of trade and investment through regional integration. They re-affirmed their support for engagement with the region, which has substantial development needs that require appropriate response. Therefore they called on the OECD’s engagement with this region to be accelerated, go beyond usual OECD outreach activities and look for concrete results. Ministers also underlined the importance of adopting a long-term perspective as well as a demand-driven, differentiated and country-specific approach, together with a reinforced regional approach. They welcomed the strong role played by the OECD in the Deauville partnership platform. They expressed support to the OECD work on Open Government Agenda and welcomed its implementation in Tunisia and Jordan. Ministers further encouraged the OECD to offer structural assessments, monitoring tools and thematic support to offer guidance and ways for improving governance and integrity, investment, social justice, economic performance and job creation, entrepreneurship, gender equality, education and territorial development. They also welcomed efforts by MENA countries to adopt OECD instruments, in particular the adherence of Tunisia to the OECD Declaration on International Investment and Multinational Enterprises. They also recognised Member countries’ contributions to support the OECD MENA programme. 22. Ministers welcomed the significant contributions by the OECD to the international governance architecture, in particular to the G8 and G20 processes in those areas where it has competitive advantage, including the Framework for Strong, Sustainable and Balanced Growth, food security, green growth, taxes, anticorruption, trade, development, financial education, financial consumer protection, disaster risk management, and employment, as well as its contributions to meet global challenges. 23. Finally, Ministers encouraged the OECD to intensify efforts to improve its efficiency, effectiveness and transparency and welcomed the OECD’s commitment to open data and its efforts to embody best management practices. They considered various reports and suggestions for new areas of work and noted that, for an effective delivery, they should be reflected in the upcoming Programme of Work and Budget of the Organisation, and adjusted depending on the level of financing.